What’s next for Tech’s basketball program? 12-19, is the record that will go into the history books for the 2014-2015 men’s basketball season. Even the most pessimistic of Tech fans wouldn’t have believed that 12-19 would be this year’s record, as many people had expectations of making the NIT. It has now been five years since Tech has made the NCAA tournament and there have been no NIT berths in that span either. In 2011, Brian Gregory was hired as Tech’s basketball head coach by former Athletic Director, Dan Radakovich. At the time, Tech was paying off former football coach Chan Gailey and former basketball coach Paul Hewitt. The athletic department also did not have the money to attract a high profile coach. Tech, decided to hire a disciple from Michigan State head coach Tom Izzo and was well held in high regard by other college basketball personnel. Gregory won a national championship in 2000 as an assistant coach at Michigan State and won the 2010 NIT Championship against UNC. Gregory, who was hired in 2011, had a contract that added up to be around one million a year. One million dollars is a cheap contract by ACC standards and it was more friendly to Tech as the buyout was not large. Coming into this year, Tech did lose several key players, but gained players who were expected to come in and contribute. But, the season didn’t work out to the expectations that were set after a convincing victory against arch-rival Georgia this year. Gregory became 4-0 against the Bulldogs, but the UGA-Tech basketball rivalry is meaningless compared to ACC play and ACC play would be Gregory’s kryptonite. 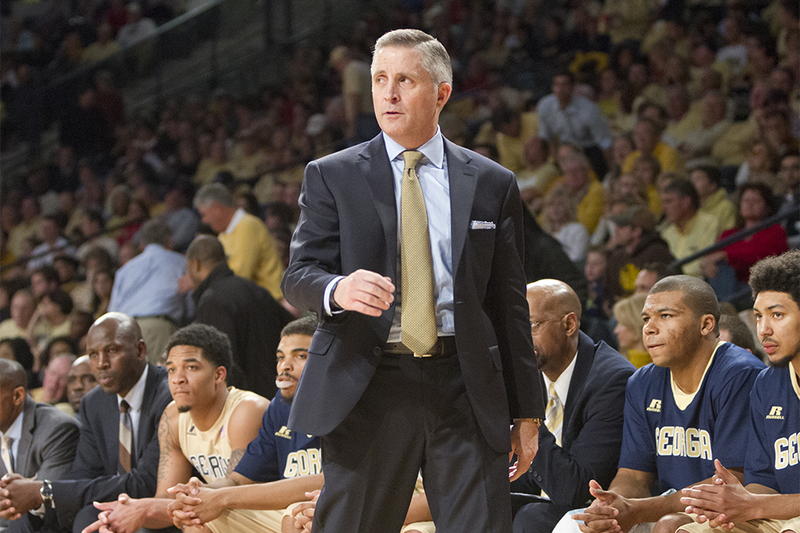 Through his four years, Gregory’s regular season ACC record is 19-51 (.271) and his overall record is 55-71 (.436). Gregory is still on contract through the 2017-2018 season, but Gregory signed the extension knowing that his status would be reevaluated at end of year. Current Tech Athletic Director, Mike Bobinski, showed his support of Gregory with the extension. But, after a 12-19 season and the most ACC losses Tech has ever had, it is very unlikely that Gregory is retained. The student and fan support dwindled throughout the year as Tech lost many close games to ACC opponents. But, close losses are irrelevant and being a college basketball coach is about wins and wins only. The outside factors such as graduation rate matter, but when millions of dollars are in play, winning results are expected. Hewitt, showed that the Tech basketball program has the potential to make the Final Four. If Bobinksi does not believe Gregory is capable of leading Tech to success in March then it should be an easy decision. Bobinksi, is expected to make a decision soon and Gregory has the character of a coach that every program would want. He just hasn’t been able to produce a team that isn’t in the bottom of the ACC. Credit should be given to him for always inspiring the team under adversity, and no one wants Tech to do well more than him. But, sometimes things don’t work out as they are planned. Due to the non-existent basketball atmosphere on campus and upset fans, it would be a surprise if Gregory returned to coach next year. If Bobinski goes the route of keeping him, Tech will once again return a team made up of all Gregory recruited players. But, will be losing two starters in the front-court. With only one recruit signed, Tech will once again look into the transfer pool for temporary players. Given the results of the last two years, that strategy does not appear to be working. If Gregory is let go, Tech will be paying off Hewitt and Gregory. Gregory’s buyout is around $2.4 million and this will be Bobinski’s first major hire as Tech Athletic Director. Given the circumstances, Tech is not expected to pay a lot of money to their basketball coach, so it is unlikely that Ben Howland or Archie Miller are offered the job. At Xavier, Bobinksi hired three basketball coaches during his time at Xavier. Thad Matta, Sean Miller (Archie’s older brother) and Chris Mack. Neither of the three were big name coaches upon hiring and all three have been very successful. Matta is now at Ohio State and Sean is on track for a Hall of Fame career at Arizona. Bobinksi has an excellent track record when it comes to hiring basketball coaches, but his three hires at Xavier had a combined one year of head coaching experience. If Bobinski goes that route again, Tech’s coach may not have the name recognition that will instantly rejuvenate the fanbase. However, Tech will be paying off Hewitt until 2019 and Bobinski has proven that he can be trusted in this type of situation. A formal announcement on the fate of Gregory and the basketball program is expected to be made within the next week.